Faced with the challenge of how to effectively access the right to remedy in the European Union for human rights abuses committed by EU companies in non-EU states, a diverse research consortium of academic and legal institutions was formed. The consortium, coordinated by the Globernance Institute for Democratic Governance, became the recipient of a 2013 Civil Justice Action Grant from the European Commission Directorate General for Justice. A mandate was thus issued for research, training and dissemination so as to bring visibility to the challenge posed and moreover, to provide some solutions for the removal of barriers to judicial and non-judicial remedy for victims of business-related human rights abuses in non-EU states. The project commenced in September 2014 and over the course of two years the consortium conducted research along four specific lines in parallel with various training sessions across EU Member States. The research conducted focused primarily on judicial remedies, both jurisdictional barriers and applicable law barriers; non-judicial remedies, both to company-based grievance. 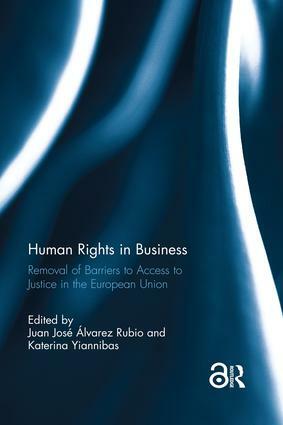 The results of this research endeavour make up the content of this report whose aim is to provide a scholarly foundation for policy proposals by identifying specific challenges relevant to access to justice in the European Union and to provide recommendations on how to remove legal and practical barriers so as to provide access to remedy for victims of business-related human rights abuses in non-EU states.